A properly seasoned cast-iron skillet has a nice sheen that makes it virtually nonstick for many foods. Aside from helping to preserve the integrity of the pan, this seasoning means that you won’t need to use nearly as much oil in cast iron cookware as you would in other pans, and obviously, cutting down on oils and fats in cooking is never a bad thing. * Cover the bottom of the pan with a healthy layer of kosher salt and add about a half inch of cooking oil. Heat the skillet until the oil gets hot enough to begin smoking then remove from heat. Carefully dump the oil and salt into a bowl and use a ball of paper towels to rub the inside of the pan until it is smooth and clean. Allow to cool before returning to the cupboard. Health – Bonus Boost of Iron! While too much iron in your diet is not a good thing, it’s hardly a problem for most people. In fact, it’s estimated that 9.6 % of Americans and 30% of the world’s population are officially anemic. A lack of iron in the diet is a major cause of anemia, which decreases red blood cell and oxygen levels in the body. Women are especially susceptible to iron deficiency, and could therefore benefit the most from cooking with cast, particularly during pregnancy. While cast iron cookware doesn’t release harmful chemicals into the air or into your food, it does add trace amounts of iron. In fact, the iron content in certain acidic foods like tomato-based sauces can be boosted about 20 times by simply being cooked in cast! 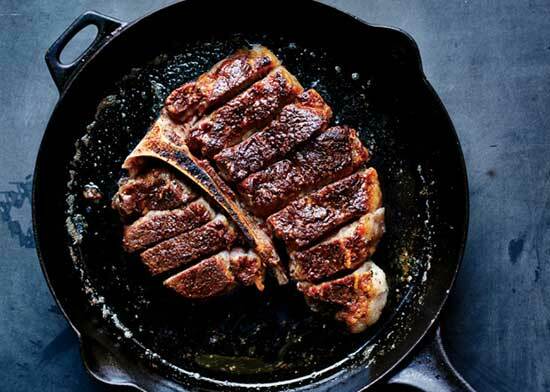 Iron-rich foods like red meat, chicken, and seafood can also be cooked better and more evenly in cast iron than any other cookware in my opinion. The internet is full of recipes to be cooked in cast, everything from traditional meat and potatoes, to stir fry and paella dishes, even desserts. So the next time you’re in the market for some quality cookware that will last you a lifetime, consider cast, your pocketbook and your health may greatly benefit!